The section of the page below features 15 short videos. Each is an essay that explains a portion of the NAASCA mission and our programs. They're all numbered, and here's the list of topics. Just go to the video you wish to view. Bill Murray, founder and CEO of the National Association of Adult Survivors of Child Abuse (NAASCA), speaks of April as the month we survivors and advocates celebrate Child Abuse Awareness and Prevention. We do this, of course, all year long. We're all responsible for outreach and fully half of NAASCA's mission is to educate the public. The other part is to offer hope, healing and meny services, tools, programs and resources th the still-suffering trauma survivor. Bill also reminds us that wearing a Blue Ribbon is a simple yet effective way to show you are child abuse and trauma informed .. and willing to share! Please share these videos, and our mission, in any way you can! We do episodes LIVE six nights a week - 8pm EST (so 5pm PAC) for 90 mins. All our shows are recorded and become on-demand podcasts in our ever-growing library (now approaching 2,700 episodes). Just go to BlogTalkRadio.com/NAASCA to hear the LIVE shows over your computer. We feature several unique and valuable tools and services that will appeal to virtually every visitor to the web site. Among the most useful are our global 'Recovery Groups & Services' and our 'Calendar of Events' tools. We've now completed what originally seemed like a daunting project, listing ALL the English speaking 'Recovery Groups and Services' and 'Calendar Events' we can find, not only in North America but from around the world. Remember, these are living lists. You can help us by submitting any updates and / or corrections by writing to our dedicated NAASCA volunteer, Carolin O'Hara, in London, England, who diligently maintains these files daily. Can't find a local Recovery Group to attend? Why not start one yourself? No doubt you'll be joined by other child abuse survivors in your area! We offer ideas for four different formats, two with well established organized organizations and two more casual and simple to launch. Be sure to let us know once your newly launched group is established. We'll add it to our 'Recovery Groups and Services' tool! Just write to Carolin, in London, England, who regularly updates these files. Let's get meeings in every community. They all need it. There are hidden survivors of child abuse everywhere! We now have a 'ProShop' at Vistaprint, designed to offer products with the NAASCA logos, business cards, posters, banners, signs, promotional materials, and printed supplies, etc. Some things are quite inexpensive, some moderately priced and some a tad costly (banners & tablecloths, for example). Many of these items are perfect for using as both awareness and fundraising tools, since you'll be able to offer a lot of them for free, and other, larger items, for 100% more than they'll cost you. Donate what you make to NAASCA. But wearing a T-shirt or passing out your business card is a terrific way to spread our NAASCA name! Prevention is an adult activity -- Children are born as blank slates, completely innocent, vulnerable and malleable. They have no internal 'manual for growing up' so teaching them 'Prevention' (giving them age appropriate information about abuse issues) is an adult activity, an adult responsibility. We're impacted as kids, imprinted, by the human interactions we experience as youngsters, starting at birth. That's when the very foundation of the rest of our lives is formed. As youth we accept our lives as 'normal,' at least until we're able to compare our upbringing with what we see in others. We simply know no difference. All adults are responsible for all kids. We implore parents to resist any reluctance to teach 'Prevention' to their children. And because so many kids are abused in the home, NAASCA believes all schools should be doing this too, from Kindergarten through 12th grade. Intervention is an adult activity -- Recognizing child abuse and trauma isn't always easy, but it's an adult responsibility. Look for are changes in a child's behavior, attitudes and performance, different for young kids and those who are older. We need to learn how to talk to children in a non-threatening way. There's a different approach for very young kids, for those a bit older and for teens. Try not to over-react or to express anger about what you're learning while you talk to a child. If you have enough of the story to be 'suspicious' of abuse one needs to know how and where to report it. Ultimately the investigation of the crimes of child abuse is a job for the professional child welfare worker or law-enforcement. But .. without our tips, predators will continue to abuse our children with impunity. Primary to the mission at NAASCA is helping fellow child abuse survivors to get into Recovery, or on a 'healing journey'. We recommend no specific path for recovery. There are many tools, and we recommend, and describe, them all. Ministry, therapy, psychiatry, counseling, life coaches, peer-to-peer groups, 12 step programs, etc .. all are valid approaches. Tools include journaling, hypnoses, EMDR, body work, art therapy and many, many more. The main thing is we have to learn to give up our secrets in appropriate ways, with appropriate people, because it's in doing so that we begin to relieve the burden of dealing with our trauma alone. We want to help you have a happy, healthy, productive life, and meaningful relationships. A quick way to see what NAASCA offers is to look at the HIGHLIGHTS page on the web site. Many of the over 30 FREE services, projects, tools and our many many resources are succinctly listed there. Our volunteers, made up of adult survivors on a healing journey and our many friends, believe in a three tiered approach including prevention, intervention and recovery. We belong to no other group, and receive no outside funding. We do our work out-of-pocket, depending entirely on the voluntary contributions of our members, friends and supporters to be self-supporting. We're all non-paid NAASCA Volunteers, and everyone is involved to some degree with OUTREACH (spreading the word about NAASCA's mission) and helping to FUNDRAISE (encouraging financial contributions to support our efforts). Among the many ways we communicate is via social media, and we have platforms of every sort. NAASCA's web site is the portal for many of them, listed across the bottom of the HOME page. A Facebook page (and multiple groups), Instagram, LinkedIn, Twitter, our BLOG and a Newsletter are all available. You'll meet hundreds of fellow survivors and activists in our FB group(s) alone. The first one is PUBLIC. But be sure to join our CLOSED group, too, because only fellow members can see what you say there. When you join, we recommend that you introduce yourself in each group with a short post .. so that other folks will know you're there. You'll start making friends right away. You'll never be alone again, a day at a time, if you don't want to be !! Wednesday and Friday are our 'special guest' shows. Most of the time our guests tell their personal trauma-related life stories in a conversational manner, speaking of their youth, adolescence and young adulthood. The host will then have a guest explain how their trauma effected their later life. Finally, guests talk about their recovery and healing journey .. their solution .. and their hopes for the future. We'd love to have you tell your story, too. Just send an email to me, Bill Murray, saying you'd like more info. But it's easy to participate and doing so is a huge attraction to the newcomer! I've had multiple comments over time about how pleased survivor community members are to have found NAASCA. Many correctly call it a truly unique non-profit. There's a reason for this. Our group's guiding principals are based on our version of 'The Twelve Traditions' (not the Steps). We incorporate them as a protection to the organization and to you, the individual. Many note they're surprised that such an organization exists, especially because so many non-profit and services efforts they'd encountered before offered disappointing support. A lot of groups don't even return phone calls, others have extensive rules and some are quite expensive. I implore you to review 'The Twelve Traditions' on our web site, the basic spiritual principals that guide all our efforts. NAASCA isn't trying to 'eradicate' childhood trauma. That perspective's simply not an honest goal. Here's how I lead NAASCA. As the Talmud says, “You are not obligated to complete the work, but neither are you free to desist from it." This is where we stand. In our day, we're still largely at the beginning of the job at hand. A significant number of survivors are out there telling their secrets, breaking the taboo. It's a good start. But now we're engaged in step two .. trying to create a community (a lot of this on line). It will take quite a while before we really act in a coordinated way, banding together in large impressive numbers for common events. Frankly, it may take decades. But we must do this work, and NAASCA's a place where we can come together, create community. That's a reasonable goal! I want to conclude the series by reminding you there's a LOT to do in the fight against child abuse and trauma, and we're ready to help each other. We will always need more volunteers to assist, and there are many things to do. For example .. everyone can do 'Outreach' .. spreading the NAASCA name and our mission. But contact Terri Lanahan, NAASCA's Secretary and coordinator of our volunteers, to see what other participation we need. She's on the Contact List. In fact, we all are. If you want to do presentations and / or fundraising events on our behalf I suggest you get in touch with Carol Levine, our Vice-president. She has a lot of experience in this area over the years, and will be happy to assist. Tammy Shoffstall, NAASCA's Treasurer, keeps track of the books, and has been doing a terrific job, too. She reminds folks that we receive no outside funding or grants, and are entirely self-supporting through the voluntary contributions of our members. There are no dues of fees. Each of our four Board Members (Carol, Terri, Tammy and me) is working hard for our NAASCA family, along with dozens of other volunteer members, non of them paid .. and we hope you'll take up a role yourself. (2) by supporting us financially. We need, and appreciate, both .. and every little bit helps! May God bless you and the children of the world, and God bless adult survivors of child abuse. You may wonder about the theme song for the "Stop Child Abuse Now" talk radio show. We use a minute and a half of it to get the shows started, and a half minite to end them. The song "Forgotton" was written, produced and donated to NAASCA a few years ago by Carol D Levine's son and his band. A big surprise to me, I have been using it ever since! Please feel free to download it to your own computer and, as Carol says, 'Turn it up!" "Unlock The Door-Beyond Sexual Abuse," written by Deb Maybury, is available at Amazon. Please ... steal, borrow, but SHARE these 30 posters and 30 essays year-round !!! 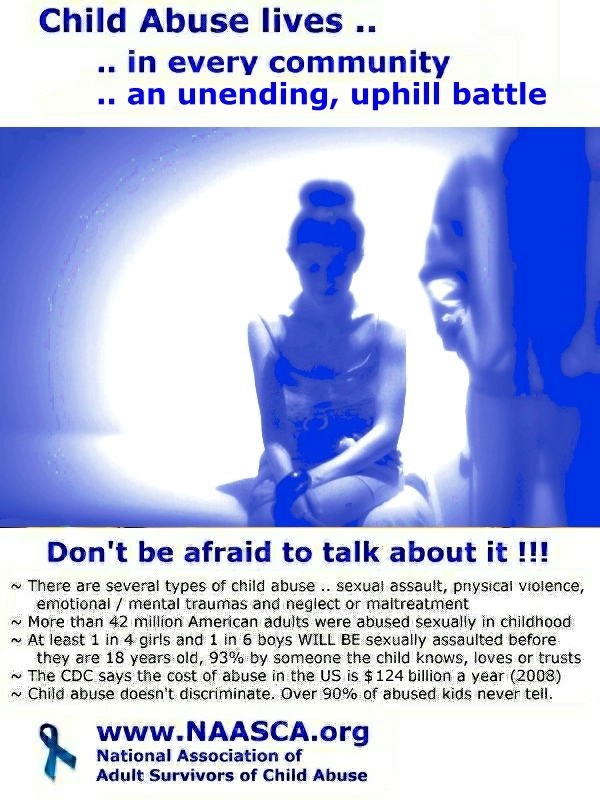 Each day in April 2014 NAASCA featured another unique offering to the community (one a day, 30 in all) encouraging those willing to speak out about child abuse. 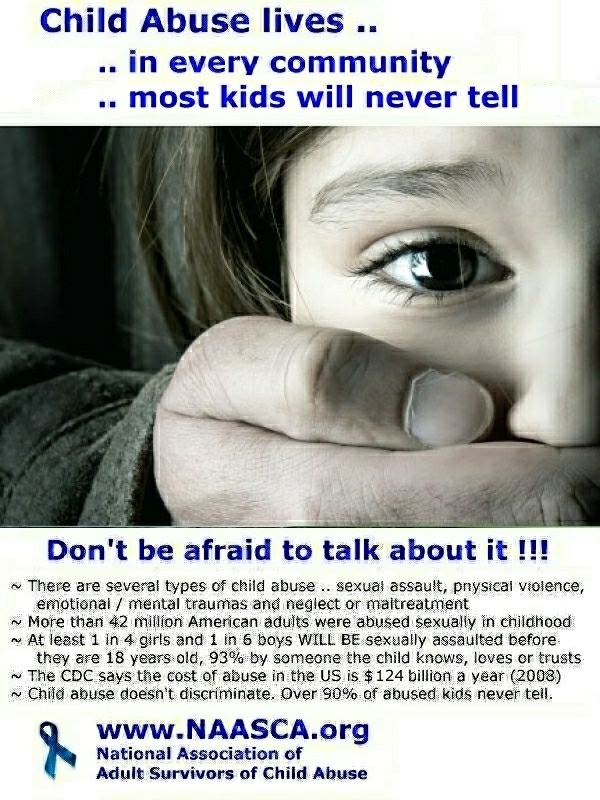 ..Our theme: Child Abuse lives everywhere, in every community -- don't be afraid to talk about it. We hope the posters, associated essays and links we offered will get the conversation going! NAASCA Celebrates Australia's "Blue Knot" Week ! I was asked by some of our Adult Survivor friends in the UK to make up a video message supporting Australia's "Blue Knot" Day / Week, which is celebrated there the week of Oct 28. We at the National Association of Adult Survivors of Child Abuse (North America) are delighted to join our fellow activists in Great Britain and elsewhere in helping our Australian abuse survivor cousins celebrate their Blue Knot Day / Week! We're with you!!! Happy Blue Knot Day / Week!!!! America is experiencing an epidemic of child abuse. Over 39 million Americans have been sexually abused, and an even greater number abused physically .. with violence. Still others have experienced deeply damaging emotional traumas. And, sadly, 5 kids die each day from severe neglect. One in 4 girls and one in 6 boys WILL BE sexually assaulted before they are 18 years old in today's society. We must do all we can to overcome the taboo of discussing these issues. Raising awareness is the only way to defeat the denial that we are sacrificing our children, America's TRUE treasure. Please .. be a voice for the children.